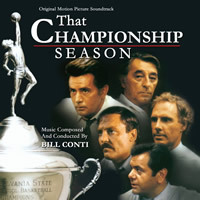 Presenting the world premiere release of acclaimed composer Bill Conti’s (ROCKY, LOCK-UP, F/X, THE KARATE KID) orchestral score to the 1982 dramatic feature film THAT CHAMPIONSHIP SEASON, starring Robert Mitchum, Paul Sorvino, Martin Sheen, Stacy Keach and Bruce Dern and written and directed by Jason Miller, based upon his Pulitzer Prize-winning play. Mr. Conti’s stirring music anchors the tragedies and triumphs of this emotionally-charged drama, supporting the cast of superlative performances. Produced by Ford A. Thaxton and mastered from MGM vault elements by James Nelson, this limited edition pressing of 1200 units features in-depth liner notes by Randall Larson.